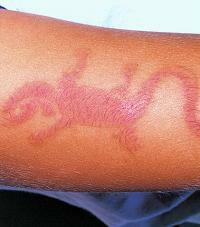 Dermatitis is a term that indicates inflammation of the skin. Contact dermatitis is a type of dermatitis that occurs when there is a localized inflammation of the skin due to contact with the same substances. Contrary to what most think, in 80% of cases, contact dermatitis is triggered by irritating substances having nothing to do with the skin allergy. Only 20% of contact dermatitis cases are caused substances that cause allergy. Irritant contact dermatitis is one that arises through direct skin damage after contact with irritants such as acids, alkalis, solvents, detergents, etc. The substances that cause contact eczema are necessarily irritating to the skin, causing damage to its most superficial layer and activation of inflammatory mediators. Unlike allergic contact dermatitis, which is an individual reaction to a substance harmless to most people, irritant contact dermatitis is caused by irritants all people. The fact that a substance is irritating not mean, however, that all people react the same way to contact the same. Apart from individual skin reaction of each, the degree of skin irritation depends on various factors such as the chemical properties and concentration of the irritant, duration of exposure, environmental conditions such as temperature and humidity, and no contact of exposed skin the product with the air, as in the cases of people who spend the day gloves. Thanks to all these variables, two individuals can be exposed to the same irritant and have very different answers. Generally, irritant dermatitis arises in people with prolonged, daily contact with substances that do not usually cause a major reaction if the contact is only occasional. A common example is soaps and detergents. Not only chemicals are responsible for skin irritation. People staying with wet hands all day, either by water or sweat, may also present maceration most superficial layer of the skin, leading to the emergence of dermatitis. Similarly, clothing which cause friction, particularly if associated to wet skin, such as socks, gloves, diapers, are also causes of irritative dermatitis. Taking into account this information is easy to understand why the irritative contact eczema is common in people who have constant contact with chemicals such as mechanics, farmers, construction workers, cleaning staff, maid, painters, hairdressers and many other. Sometimes, contact dermatitis occurs, not by skin reaction to an abrasive chemical substance, but due to microtraumas that the constant handling of certain products may cause skin, such as type materials wood, paper or glass fiber. The rash of babies in diapers is a type of irritant contact dermatitis, and occurs by prolonged skin contact with feces and urine. Allergic contact dermatitis is different from Irritant dermatitis is an allergic process. It is caused, not by direct injury to the skin for prolonged contact with an abrasive substance, but by an individual allergic reaction to contact with a product. The irritants to the skin can cause irritant contact dermatitis in all who are exposed to them, as long as there is time to be injury in the most superficial layer of the skin. In allergic contact dermatitis, the reaction is immunological and arises even after short exposures. If the patient is not allergic, it can be prolonged, daily contact with the material, which still no dermatitis will occur (unless the substance is also able to induce irritative dermatitis). A simple example to understand is allergic contact dermatitis caused by the nickel present on the buttons of his jeans. You can wear jeans to life and have the touch button with your skin without ever having any problem. But who are allergic to nickel can develop contact dermatitis in the area around the navel where the button comes into contact with skin. Allergic dermatitis can occur after a first contact with a particular substance, or even after years of contact with a product that never caused you allergies. Nickel, buttons, necklaces, bracelets, earrings and other jewelry. Poison ivy, poison oak, poison sumac. Thimerosal, a former component merthiolate and currently present in some drugs and vaccines. Benzocaine, present in topical anesthetics. topical antibiotics such as neomycin, bacitracin and gentamicin. creams with corticosteroids such as hydrocortisone. Fragrances contained in perfumes, shaving lotions, deodorants and soaps. Formaldehyde, found in some shampoos, conditioners, moisturizers and cosmetics in general. The symptoms of allergic and irritant contact dermatitis are not equal. While the allergic form the predominant symptom of lesions is itching, irritating the way there is more pain and burning. We will describe the main signs and symptoms of each form. The most common symptoms of allergic eczema are intense itching and rash relief and reddish. In severe cases, the lesions may form blisters and cause pain. The rash is usually limited to areas that were in direct contact with the allergenic substance, but it can appear in other areas of the body, if the allergen can be carried by hand during scratching. The outbreak of allergic contact dermatitis usually appears within the first 12 to 48 hours after exposure to the allergen, although sometimes it may take up to two weeks to arise as in the case of creams neomycin, which penetrate the skin slowly. Mild irritants can cause redness, dryness, itching and small cracks. strong irritants usually cause swelling, pain and blisters. In some severe cases, the injury is a typical chemical burn. The hands are areas most commonly affected by irritative eczema, mainly on the back and between the fingers. In both forms of contact eczema, the main action is to remove the contact with the irritant or allergen product. In allergic dermatitis, once the patient no longer has contact with the substance triggering allergy, the lesions tend to disappear within 2 to 4 weeks. In irritative eczema, use gloves to avoid direct hand contact with the irritant is essential to improve the medium / long term. However, if the patient has to use common form of glove it is important to see if the dermatitis is not being triggered by some substance in the glove itself. The hand actually get sweaty and enclosed within a glove for several hours a day can also be the cause, in which case, the patient is accustomed to dry and aerate hands from time to time. While the patient remains in contact with abrasive or allergenic substances, the lesions will be difficult to treat. In both cases, moisturizing creams and calamine lotion helps to "pacify" the skin and relieve symptoms. In more severe cases, corticosteroids ointments may be used. If symptoms do not improve with topical treatment, the use of steroids by mouth may be indicated by the dermatologist.